What a slippery, cold, wet hug!!! We were once again hugely blessed at our annual 'Play it Forward' Camp held at Golden Harvest Retreat. 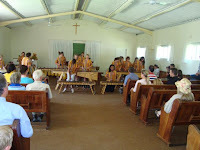 This is a working camp where the outgoing Gr 7 members 'play it forward' to the new members of the band, by teaching them part of their existing repertoire. The fish was this big...! Not only is it a time of learning music repertoire, but it is a time of bonding for the new band. Much emphasis is put on what it means to be part of a team, how to listen to each other, and look out for one another. The older members pass on their knowledge to the younger members too, by leading devotions and discussions. By the time we left camp, the barriers of grades 4 to 7 had been broken, and the team was a family! We held two impromptu concerts which were delightfully and wonderfully received. The first concert was for a visiting church group, and the second concert was for the community of Rosetta - some people even travelled from Pietermaritzburg when they heard the band was going to play. The children gained much encouragement from the enthusiastic audience response. Mr and Mrs Gericke (and young Chloe Gericke) were in charge of the evening games session - and we had some hilarious times, but all in good fun! Only.........365 more sleeps till Camp 2012!!!!!!! !